Strategic Innovation Lab has developed a repertoire of systems mapping methods and outputs to help understand and guide complex service design, social system design, and knowledge translation for complex systems research. 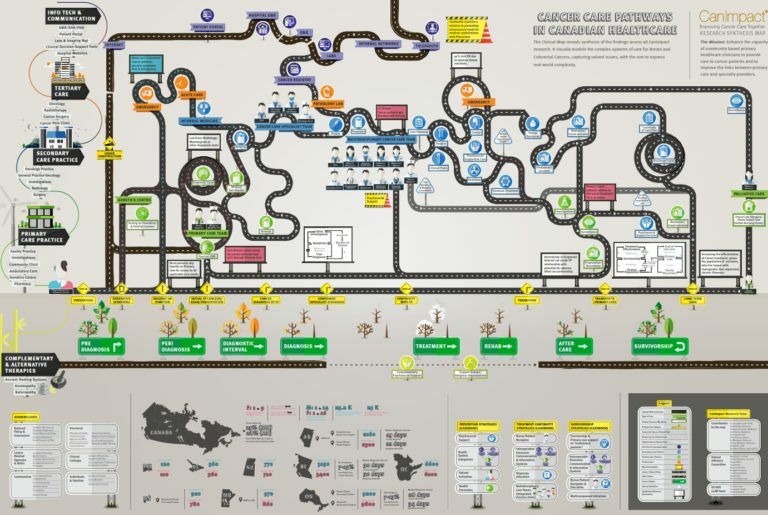 Synthesis maps are typically designed as communicative artifacts that translate multiple knowledge perspectives about social systems to illustrate the dilemmas and challenges within a complex system scenario. Synthesis maps are particularly effective in representing multi-level social systems such as are common in healthcare – indicating an outer boundary (e.g., national or provincial system), the service networks, agencies and specialized providers within a care context, for example. Gigamaps and synthesis maps look very similar as finished products. However they differ in their developmental processes. Both are rich images that visualize complex system problems, and both are used as design artifacts in similar domains (from health to public policy, from service experiences to social change). Both are used with stakeholders for advising, planning, and designing for social and systemic challenges (wicked problems). Gigamaps are more "direct engagement in the relations of a system." Gigamaps employ a research through design (RTD) practice of engaging directly with a system problem and following the contours of the complexity as expressed in a design space. Synthesis maps evolved from the SFI pedagogy necessary to train students in systems thinking and to learn both system formalisms and systemic design for complex multistakeholder problems. Synthesis maps are typically designed as communicative artifacts that translate multiple knowledge perspectives about social systems to illustrate the dilemmas and challenges within a complex system scenario. The SFI maps have been developed in half-term courses guided by design-led field research and extensive secondary source references to build descriptive system maps as a mapping of territory for systemic design of the social systems of concern. sLab also develops a core systems theory or methodology within the SFI maps as a means of pattern and leverage. Because the process sLab teaches is developed more as a synthesis of evidence and is informed by theory, their process is better considered as a Synthesis Map. The typical synthesis map process requires a small team of graduate research assistants trained in the method, directed by a faculty advisor in a collaborative design process. Working through a series of drafts on paper and electronic modes, the team starts with a preliminary map, often sketched using graphic recording and rough free skecthes, followed by an integration of core concepts. Iterative refinements are made with sponsors/stakeholders to interactively integrate their insights and proposals with the design team's system maps. The move toward final synthesis and visualization progresses through studio workshops and team design and critique. The CanIMPACT Project (Canadian Team to Improve Community-Based Cancer Care Along the Continuum) is a multidisciplinary pan-Canadian program studying how to improve cancer care to patients in the primary care setting. Funded by the Canadian Institutes of Health Research for 5 years (2013–2018, Grant no. 128272) the project was led by Dr. Eva Grunfeld, Director of Research at U Toronto's Dept of Family and Community Medicine. 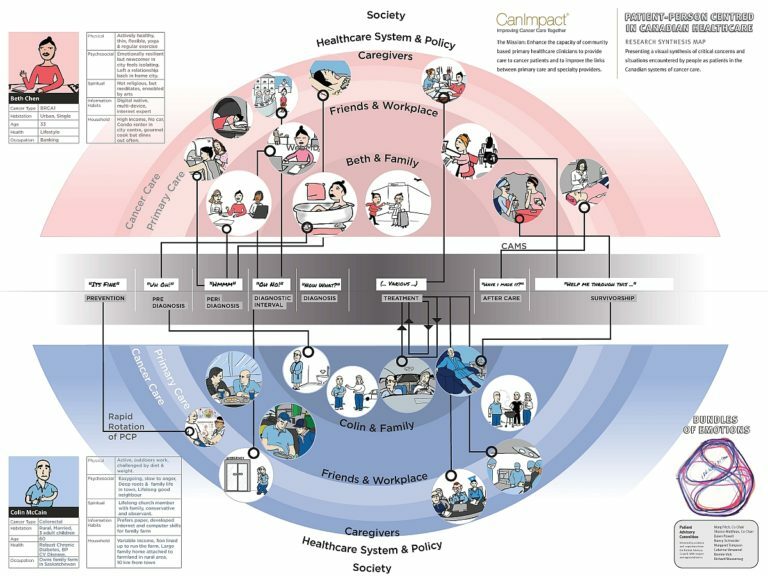 For the CanIMPACT synthesis map project, the sLab team (Jones, Smriti Shakdher, Prateeksha Singh) prepared two synthesis maps to reflect the discovered insights from the multi-year investigation: a clinical system map and a patient-centred map informed by the CanIMPACT Patient Advisory Council. The resulting maps were published (a first for a system map method) in Current Oncology and presented at the first Canadian Partnership Against Cancer (CPAC) conference, and MedicineX 2017. A domain and literature review: A scoping review of the CanIMPACT study and its references was conducted. Continuous searches informed emergent questions for representing mapping decisions. Expert interviews and content analysis, with Visual Notetaking: The CanIMPACT qualitative study, the Casebook survey of cancer initiatives, and administrative data substudy reports were analyzed, guided by interviews with study area leads. Knowledge Synthesis to design Maps in stages: In collaborative sessions, maps were hand-sketched to represent salient findings drawn from content analyses. Peer critique of electronic and print Maps: Structured critiques of the maps were held with the CanIMPACT and PAC experts at key stages of map development. Iterative Map Design: The clinical map was developed first, in stages that adhered to the method. The necessity for a patient-centred map was discovered during the peer critique step. 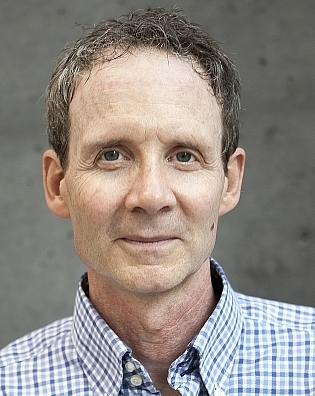 This project exemplifies well how the synthesis mapping approach can lead to high-quality representations of insights from complex research, how deeply deliberated discourses within a clinical or social research team can be articulated as systemic models, and how new knowledge production can be further developed toward strategic design outcomes such as program strategies and policy interventions. For further information on synthesis mapping and the CanIMPACT Project, please visit http://slab.ocadu.ca/project/synthesis-maps-gigamaps.